Megan and Tyler Duncan had long dreamed of building their own Wisconsin getaway. Tyler’s parents owned a cabin on Bone Lake in Luck, so the couple knew and loved the area from countless visits. They hoped to have something similar one day for their nuclear family of five. Serendipity intervened when an existing one-room cabin went up for sale in 2013 just one door down from the elder Duncans’ place. Megan and Tyler immediately put their dream in overdrive. After all, with three kids under 10 and busy lives in Shakopee, the Duncans needed a place to relax. The new house would be the couple’s own spot to make memories with family and friends. It would showcase the ample shoreline and wooded lot, bringing the outdoors inside with large windows and natural materials. “We wanted a cozy and comfortable place where we could go with family and friends, with the kitchen being the center of everything,” says Megan. In addition to communal spaces, they wanted plenty of quiet corners for people wanting to get away inside the getaway. The couple hired Stonewood in Wayzata to design the house, B & H Builders in Cushing, Wisconsin, to build it, and Martha O’Hara Interiors in St. Louis Park for the interior design and furnishings. The team worked in close collaboration with the Duncans to create their year-round haven. 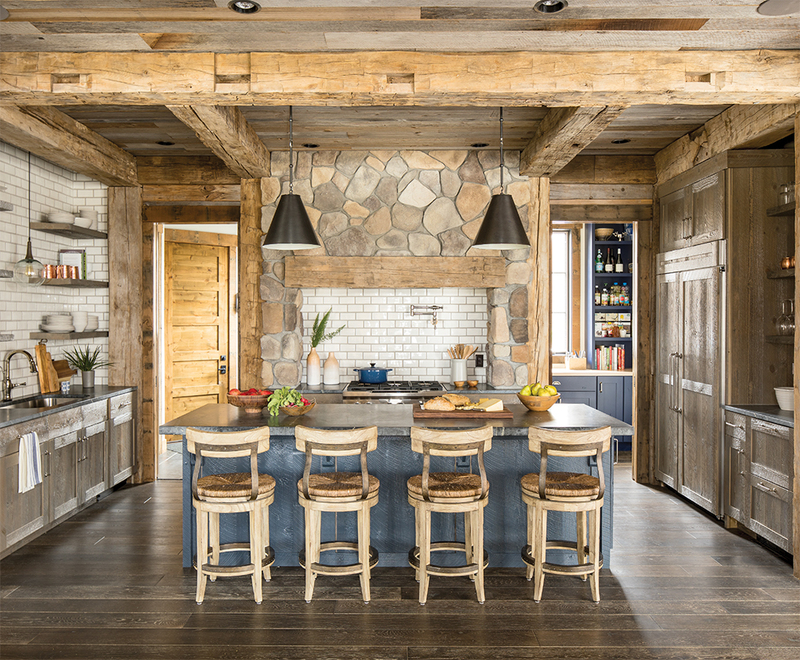 Completed in 2016, the 5,000-square-foot home is a study in rustic sophistication, with reclaimed millwork, natural stone, and a neutral, airy palette. Those three rooms feel open, yet are visually tied together by the wood beams, posts, and ceilings. A river rock fireplace in the living room feels right at home nestled into the ceiling beams. Those materials are echoed in the kitchen, where an enormous hearth-like surround frames the range. An open-weave rope chandelier over the dining room table brings in another natural texture that is complemented by the wicker in the kitchen stools. To keep the windowless kitchen from feeling boxed in, Martha O’Hara interior designers Kristy Conlin, Andrea Surtel, and Bhavana Bhimavarapu used crisp, white subway tile on several walls and open shelves instead of upper cabinets. It’s a visual trick that makes the kitchen feel spacious and light. 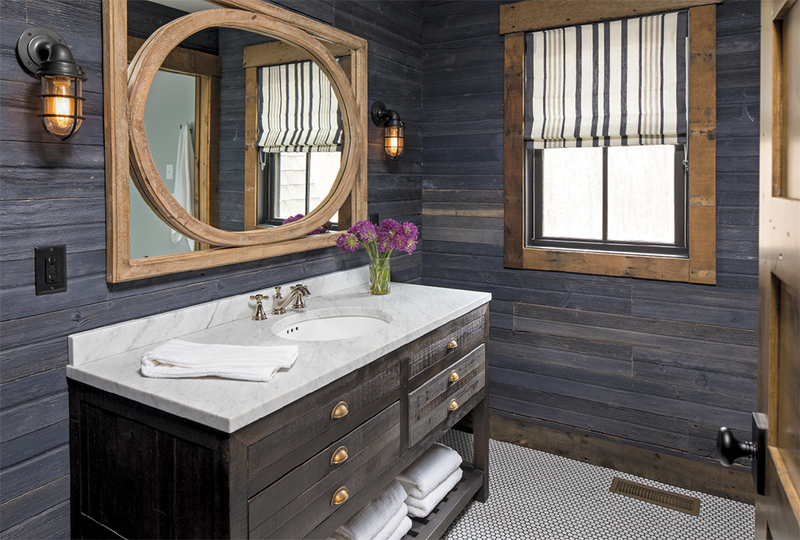 The dark gray soapstone island and hickory and oak cabinets weave in different colors and textures while acting as a refined foil for the rugged beams. The adjacent hearth room, which incorporates wood reclaimed from a shed on the property, is handy when there’s a houseful. It keeps the kids nearby, but gives them a space where they can play on their own, says Megan Duncan. The nearby screen porch with a fireplace is the perfect spot for curling up under blankets on a fall day or simply enjoying views of the lake and the woods. The family room is also a favorite place for snuggling on the cozy sectional and watching movies. 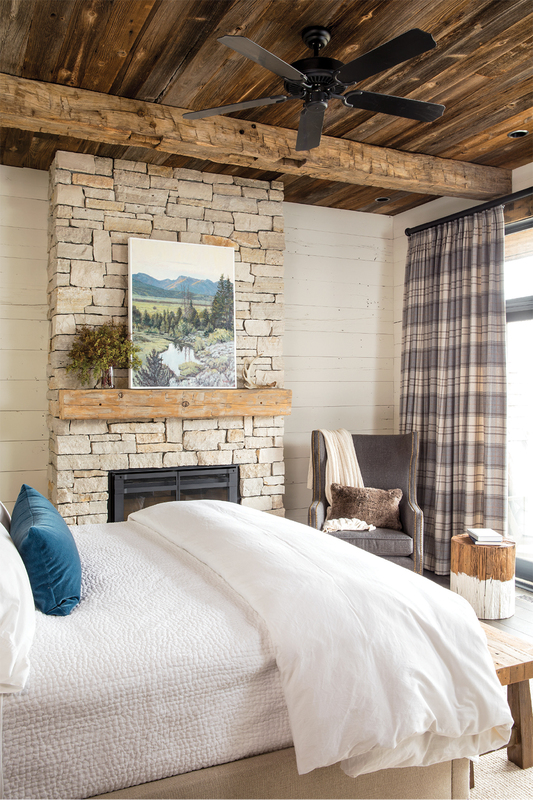 Accents of plaid, wool, fur, and—of course—reclaimed wood on the walls and ceiling give the room a welcoming warmth. The house has four bedrooms, including the master. It’s a retreat within a retreat, containing a natural stone fireplace, wide wood panels painted white, and a balcony for enjoying morning coffee, and the sights and sounds of the lake. Then there are the spaces that the kids just adore. 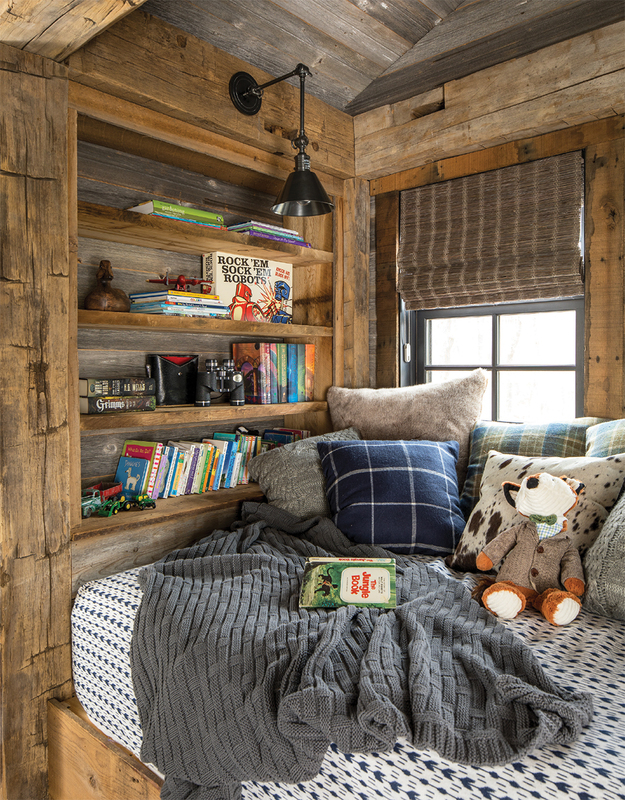 The reading nook, which was built in unused attic space, is a snug hideaway, complete with wood bookshelves surrounding a small pillow-laden daybed. In one bedroom, a secret place beckons the adventurous with a child-size door that leads to a bean bag chair-filled fort. Kids of all ages flock to the basement for entertainment of all kinds: playing video games or ping-pong, watching movies, or just hanging out after a day on the lake. A guest bedroom and spacious bunk room provides ample guest quarters. 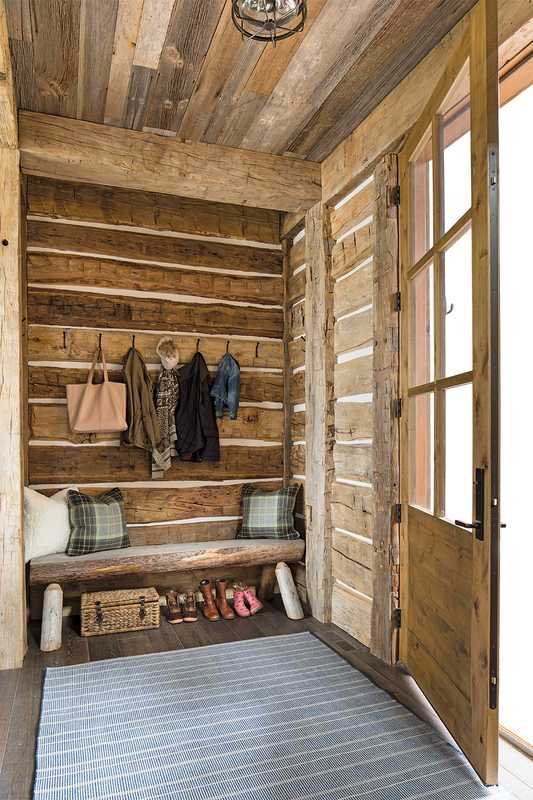 It all came together perfectly for the Duncans, who use the cabin year-round. Whether they arrive for sunny summer days or a cozy Christmas morning, the house has become a favorite place to unwind and spend time with family and friends. “We usually have a houseful, but it’s so fun,” Duncan says. “The house has good flow, and everyone can be together or have their own space.” And that makes it a true retreat for all. Suzy Frisch has been a Twin Cities journalist and freelance writer for more than 20 years, covering health and medicine, entrepreneurship, and higher education for Twin Cities Business, Mpls.St.Paul, Minnesota Medicine, and many colleges and universities. Writing about design and architecture for Midwest Home is always a treat.